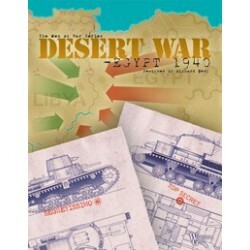 "Desert War Egypt, 1940, is a game covering Italy’s invasion of Egypt, before Rommel came to rescue them from their folly. This game uses an updated, and slightly expanded, version of the MedWar Sicily game system: no CRT, just dice, and cards...a totally new approach to gaming battles that can be learned in five minutes and played in 2-3 hours. Most of the rules and mechanics will be familiar to anyone who has ever played a wargame. Richard Berg however, has added to this simplicity a combat system that rates units for how many dice they get to roll on their behalf, as well as what kind of dice (small arms or Heavy Weapons). The game also uses cards, one deck (of 10) for each player (whose cards are somewhat different from those of the other player) to enhance the game. (They don't "drive" the game and they can be left out, if you’re so inclined.) The cards are part of a Resource system that gives the players a number of points which they can use to buy cards, rally units or bring in reinforcements. The choice is theirs, but there are far more choices than points. The cards, themselves, give the players "Opportunities", from using their (or negating their opponent’s) tank capabilities, to getting more supplies, to special Breakthrough and Reaction movement. 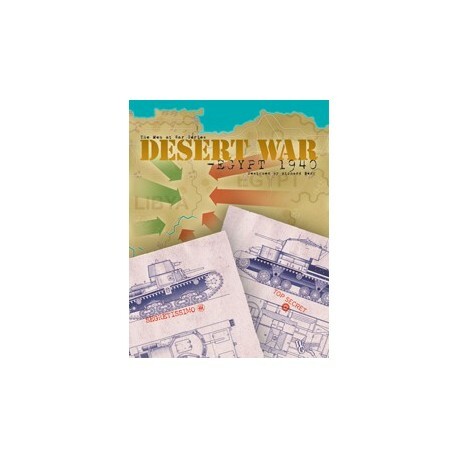 Playing time for “Desert War Egypt” as averaged less than 3 hours, and the rules are only 8 pages, including rules for playing Solitaire. Each game of Desert War Egypt includes full box, rules, one sheet of large 5/8” die cut thick counters, dice, two decks of 10 cards, and a thick card stock game board. We are putting this game at a very low pre-release price to introduce players to the system which includes MedWar Sicily (currently available), and upcoming games East War Russia 1941, and Guns of August 1914.